Early on, my daughter Lauren told me I needed to post every week. I thought this was a little crazy, but I have managed to do it. I made it my goal to post 2 to 3 new recipes a week, along with 1 to 2 posts that supported the recipes. 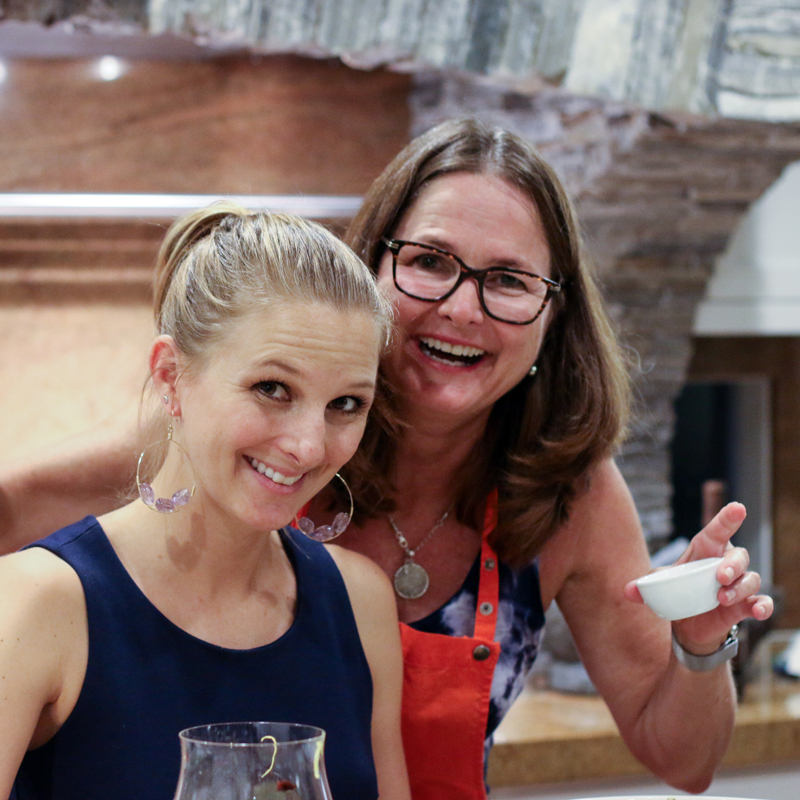 Topics include ingredients, cooking methods, nutrition, tools I love, and fun stuff like flower arranging and restaurant and travel tips. What I didn't know was this editorial pace meant blogging would be my full time job. The good news is that I love it, so that although the schedule can be hectic, I am having fun every day. I could never have built Something New For Dinner by myself. Fortunately I have very talented family members who have generously contributed. My daughter Lauren, founder of Bixa Media, is the technical, social media and marketing brains behind Something New For Dinner, as well as a good business director, who keeps pushing me towards profitability. We have partnered together to build Something New For Dinner into a recognizable brand and a profitable business. My daughter Margo has contributed in many ways. She created the original graphic design work for our website and has contributed to the new site we are building. Margo also designed our first exclusive product that we will introduce next week. She has a great eye for photography and is always available when I have a technical crisis. My husband, JP, has been the jack of all trades. First of all he does a frightening number of dishes, for which I am forever grateful. He edits all of my recipes and posts, which regularly saves me from embarrassment. He assists with lighting while I am photographing and most recently has taken on the role of publisher for a new project I am working on. And finally, he never complains when dinner is delayed until 9 pm while I photograph my latest creation. My sons Mikey and Ryan are living out of the area, but are always available to critique new recipes when they are home. My niece Madi, who is in culinary school, cooks with me on occasion. We have a lot of fun and I always learn something when I cook with her. Building Something New For Dinner has definitely taken a team effort and I appreciate the encouragement and help my family has provided every day. I originally thought all I needed to succeed at food blogging was to be a good cook, but I have learned that food photography drives this industry. It is critical to have beautiful food pictures to sell your recipes. This is such a departure from the way I learned to cook in the 1970's, when cookbooks did not have photographs. You started cooking a recipe with no idea how it should look when you were done. Now Pinterest is the largest driver of traffic for food bloggers, so your pictures have to sell your recipes. I still have a ways to go in this category, but am definitely moving in the right direction. I am very grateful to Todd and Diane of White on Rice Couple for their mentoring, as well as Eric Otten, who also filmed and directed our first video, It All Starts Somewhere and my nephew Parker who helped me figure out my first DSL camera. Then there is developing a social media presence, which my daughter Lauren, thankfully is an ace at. I now have a presence on Facebook, Pinterest, Twitter, Instagram and food sites like Tastespotting and Foodgawker. It takes daily work to build my contributions to these communities, but we have been rewarded with a growing number of fans. We now have over 15,000 Likes on Facebook alone. When I started Something New For Dinner, I thought I was a reasonably good cook. But when you cook most every day, think deeply about the why's and why not's of cooking, break down recipes into easily understood written steps, and research and explore different cooking methods, you find you can't help but become a better cook. At the same time, I am acutely aware of how much more there is to learn. This is what makes it exciting; I will never run short of inspiration. From the start it was my goal to bring you healthful, nutritious recipes and cooking techniques. Over the course of the last two years I have become acutely aware of how important good nutrition is. Nutrition is the cornerstone of good health, and when you cook for family and friends there is a critical responsibility to provide nourishing food. Science is showing that for many years U.S nutritional guidelines have missed the mark on what makes food nutritious. I try to share with you the latest science on how to eat for your health. To all of my readers who faithfully open my email every Monday morning, who have confidence in my recipes, who create Something New For Dinner meals for their families and friends, who rate my recipes and comment on them and who have sent me such kind and encouraging notes. I am so appreciative in your trust in me. Without you there would be no Something New For Dinner. I treasure each and every comment, recipe rating and note I receive from you. You provide the inspiration for what I do each day. Thank you for two years of support. From my family to yours, we wish you a wonderful Thanksgiving and hope that we have contributed in some small way to your holiday. I’m checking in with Lockie today to make sure she hasn’t moved back! I LOVE your blog thank you and your family for all of their hard work! Thank you for your kind words. I’m going to have to give Bend a try in the winter, it was incredible in the summer. I am sure a snow-covered downtown Bend is gorgeous. I’ve been talking about coming up to give a cooking class and will let you know when I put that together. Love to Lockie!